Well the title The Perfect Drink for Every Occasion encouraged me to think that this was going to be a rather serious tome, probably penned in the 1930s by the aging bartender in some swep-up hostelry in Venice. The subtitle held out a bit more hope that this was going to be a rollicking good read: ‘151 cocktails that will freshen your breath, impress a hot date, cure a hangover, and more!’ Perhaps this wasn’t a manual on how to pour sherry, after all! Duane Swierczynski is the author and we must thank him for the dedication and the evident self-sacrifice necessary to undertake this extensive research. There are plenty of classic and celebrated cocktails listed but Duane presents them as garnishes to various occasions, predicaments or rites of passage. Choose your particular social event or dilemma and find the tipple deemed most appropriate. The chapters start with The Perfect Set-up, end with The Perfect Hangover Cure, and considers the passage from one to the other. ‘The Perfect Place’ chapter offers libations from several American cities (this is a US-biased volume), but also London, whose cocktail is, surprisingly, the Blue Hawaiian. This isn’t a sign of beverage continental drift – this cocktail was created in London’s Zanzibar Club. A further mixology connection to London is ironically the Manhattan, which was first mixed for Winston Churchill’s mum! The Perfect Drink for Every Occasion is a veritable manual of social etiquette. The chapter on Special Situations could help you maintain the last shreds of your dignity. The cocktail for when ‘You’re Having Trouble Pronouncing Words’ suggests a Tom Collins. The logic is that one is still able to say “Tom Collins” long after the ability to articulate any other words has passed. Under the title of a drink for “The Coldest Day of Winter”, in The Perfect Time and Season chapter, Duane describes a Hot Toddy from Alex Guzman, bartender at the Algonquin Hotel in New York. It’s a simple yet effective warmer with a base of either whiskey or rum; aromatic heat is supplied by cloves and cinnamon. There is additional advice with some of the cocktails, and the Hot Toddy sports this gem for the coldest day of winter: “Avoid a frozen strawberry Daiquiri sipped really fast with a straw.” A pearl of wisdom if ever there was one. 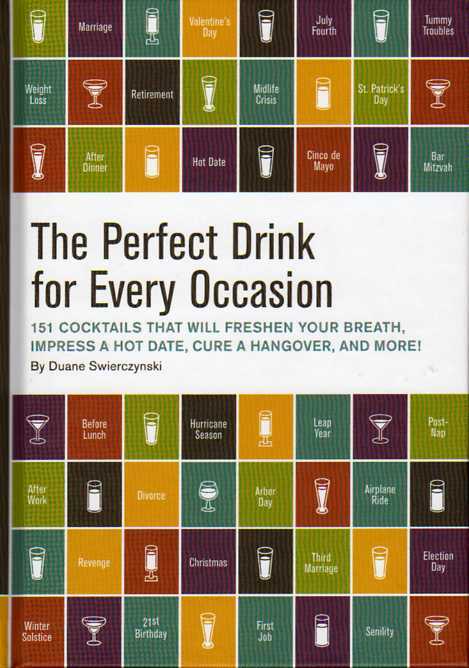 The Perfect Drink for Every Occasion is amusing but it’s a genuinely good cocktail handbook. The historic and cultural notes are both informative and hilarious. Choose this as a flat-warming gift for those who want to throw drinks parties that will at least start off chic and sophisticated. That last chapter will come in handy the day after the night before.